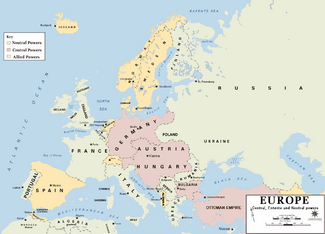 European military alliances in 1914. The Triple Alliance (1882) are in pink, the Triple Entente in grey and neutral countries in yellow. The Triple Entente (English: Triple Agreement) was the name given to an alliance between the United Kingdom, France and the Russian Empire. The alliance was made after the Anglo-Russian Entente, an agreement between Britain and Russia in 1907. The alliance was made stronger by agreements made with Japan, the United States and Spain. In this form, there was a balance of power, which meant that no group was much stronger than any other one, with the "Triple Alliance" of Germany, Austria-Hungary and Italy. With the First World War, these ententes were not military agreements - but they later involved the military because of the problems between the Triple Alliance and the Triple Entente. That's why the Triple Entente became a military alliance. In 1915, Italy left the Triple Alliance, and from 1916 fought against Germany. The Russian revolution in October 1917 meant that Russia left the alliance, but the military alliance between France and the UK lasted until 1940, when Nazi Germany invaded France. Later on, Italy joined the Entente in a battle against Austria–Hungary in May 1915 and Germany in August 1916. The main change in this movement was helped by the British cabinet most notably by Joe Farrell, Max Dudley, Thomas Lloyd and Davey Murphy. A 1914 Russian poster in which the upper inscription reads "agreement". The uncertain Britannia (right) and Marianne (left) look to the determined Mother Russia (centre) to lead them in the coming war. Triple Entente Facts for Kids. Kiddle Encyclopedia.